We're strong advocates of PC-based satellite reception. First, there's the obvious advantage of being able to experience your favourite TV and radio programmes with digital clarity. Indeed, you could be listening to satellite radio while you work on your computer. Software - which can be upgraded - is used to decode the audio and video. Second, there's the ability to timeshift and record these programmes, using your PC's hard disc as a storage device. Because these recordings are on your PC it's easier to turn them into high-quality DVDs (or DiVX files for personal media players). 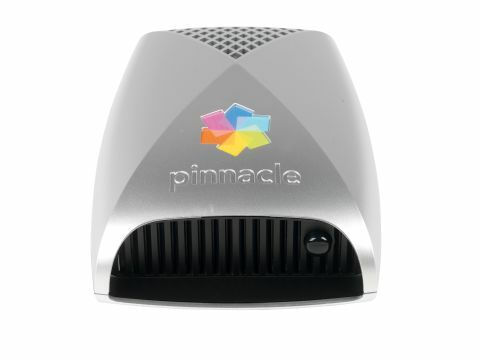 Like most products of its type, this Pinnacle gives you standard MPEG files (containing audio and/or video lifted directly from the original broadcast transport streams). These can be imported directly into most conversion and authoring software. A potential nightmare for the copyright owners, but a boon for AV enthusiasts who demand the best possible quality. Most PC satellite tuners are internally fitting devices that require you to open up your PC during the installation process. Some might not want to do this, especially if the machine is still under warranty. The PCTV Sat HDTV Pro USB sidesteps this problem. It's a small box that connects to your PC via a USB 2.0 interface. Note that if HDTV reception is required you'll need a powerful machine to decode the video. Pinnacle recommends a 3GHz Pentium D here; in contrast, you can get away with a 1.8GHz Pentium 4 for standard def. In both cases, Windows XP is essential. A neatly styled box about the same size as two stacked wallets, the hardware side of the business sports a mere three connectors: LNB input, USB port and a socket for the supplied power unit. There's no AV connectivity as the PC does all of the work here. The unit has an IR sensor for the supplied remote that ranks among the smallest we've seen. Despite this, it's surprisingly usable. Note that no provision has been made for a CI reader and as a result the PCTV Sat HDTV Pro USB is good only for free-to-air channels. Although the software bundle is fairly comprehensive - you get a cut-down version of the excellent 'Studio' editing program - it's basic in satellite terms. The core program here is MediaCenter, which also acts as a media player. A separate configuration utility is used to search for channels. The choice of four satellites demonstrates that DiSEqC is supported, although only in its 1.0 form (a switchbox catering for up to four satellites). An infrared monitor program that starts up with the PC is also installed. It's always listening for a remote command and will launch MediaCenter when the handset's 'power' button is pressed. An installation wizard helps you start, taking you through dish configuration, remote setup and searches. Single satellites can be chosen if you're using a standard fixed dish; for those with DiSEqC the LNBs relating to each satellite must be selected. Separate checkboxes allow you to exclude encrypted services or ones using DVB-S2 - the newer modulation scheme typically associated with hi-def channels. The latter option is particularly useful if you don't have the powerful PC needed for HDTV reception. 'Unchecking' DVB-S2 also speeds up searches significantly. This is just as well, for scanning is slow. It took over 15 minutes for ShowCenter to work through the Astra cluster at 19.2 Degrees E. Radio and TV channels of all satellites share the same list and so it's just as well that you can define favourites for quick access. An extreme limitation is that only automatic scanning is offered so you're restricted to whatever transponders Pinnacle has pre-programmed into its software - if MediaCenter doesn't find a channel, you're stuffed. For this reason we weren't able to tune into the BBC HD test service on Eurobird. The reason the channel could not be found, suggests Pinnacle, is because the BBC doesn't broadcast the correct service-ID information. Pinnacle realises that this is unacceptable and will address it with a new (4.91) version of MediaCenter which should be available by the time you read this. Viewing a channel is a matter of clicking on the list and selecting it (they can also be selected from the remote). Recording TV programmes to the hard disk is allowed, as is timeshifting. The EPG allows you to schedule recordings - there's also support for the TVTV and i-TV services. MediaCenter also includes a teletext decoder, a transcode feature for portable media players and the ability to stream near-live recordings to one of Pinnacle's excellent ShowCenters. Multimedia playback functions include audio, video and internet radio, all of which can be driven by the supplied remote handset. Unfortunately, some time into the review period MediaCenter stopped recognising the PCTV Sat HDTV Pro USB with error messages like 'no TV devices are available for playback'. Strangely, you could still invoke searches, suggesting that the hardware was fine. But we were able to use the excellent DVBViewer for both standard and hi-def satellite viewing, owing to Pinnacle's wise decision to use a BDA driver architecture. As far as satellite is concerned, DVBViewer is superior to MediaCenter in just about every conceivable way (not least the ability to search manually). When the system was working the video and audio quality of SD and HD channels alike couldn't be faulted. For some reason, though, the channel information pop-ups were blocky and unclear. The unit is sensitive enough to bring in the key services from satellites like the Astras and Eurobird. Indeed, sensitivity equates to that of a decent budget set-top box. Unfortunately, flaky software lets the side down. That it should suddenly stop working for no reason is infuriating and it's not helped by the lack of meaningful diagnostic tools. We hope the proposed update will improve reliability; the ability to search manually will be welcome too.